Hearing the word crepe often brings to mind images of fine dining establishments, elegant French bistros, and picturesque cafés. Which makes the thought of cooking your own crepes at home a bit intimidating. 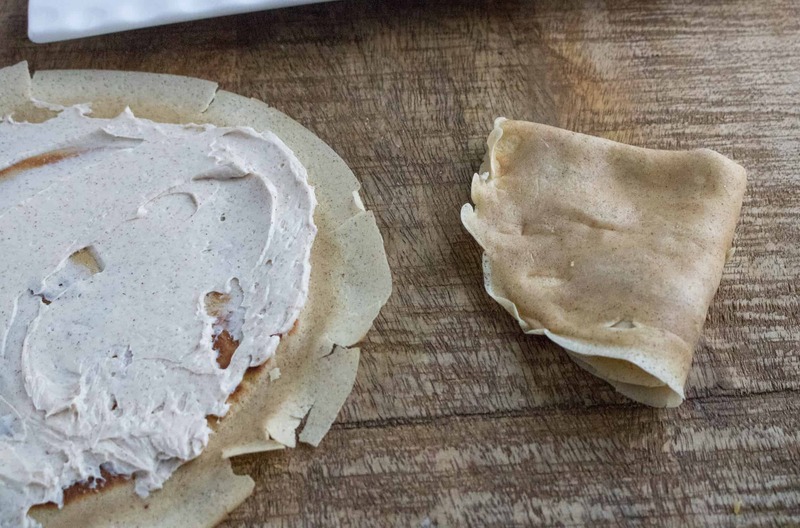 But at its core, a crepe is really just a thin pancake, either folded or rolled up (the origin of the word crêpe is the Latin word crispus, which means curled) before serving. Making your own crepes really is as quick, simple, and fun as whipping up a batch of Sunday morning flapjacks. 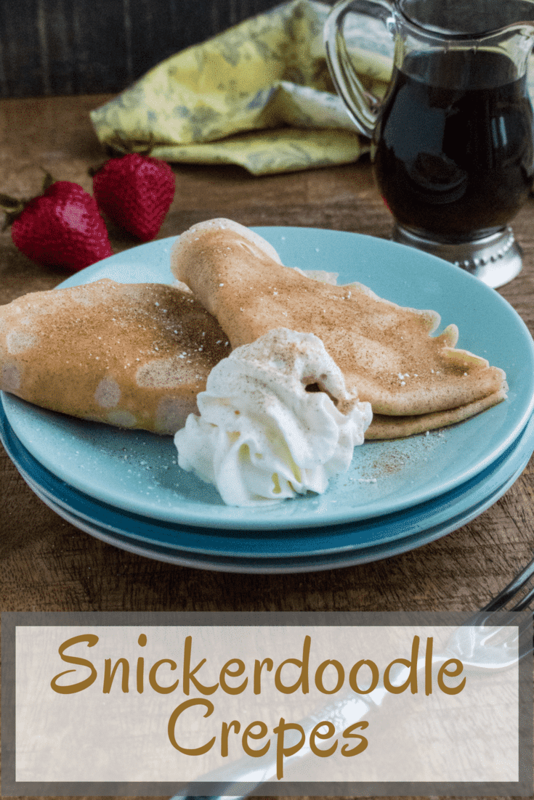 And, this Snickerdoodle Crepes Recipe brings an extra serving of fun by combining the classic flavors of the beloved (and fun to say!) 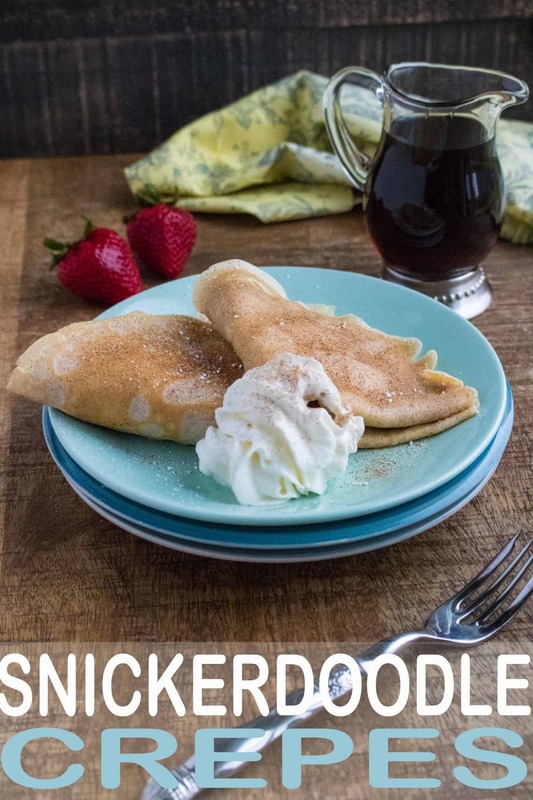 snickerdoodle cookie with delectable crepes. You will love how the light and fluffy cream cheese filling pairs perfectly with cinnamon and sugar. 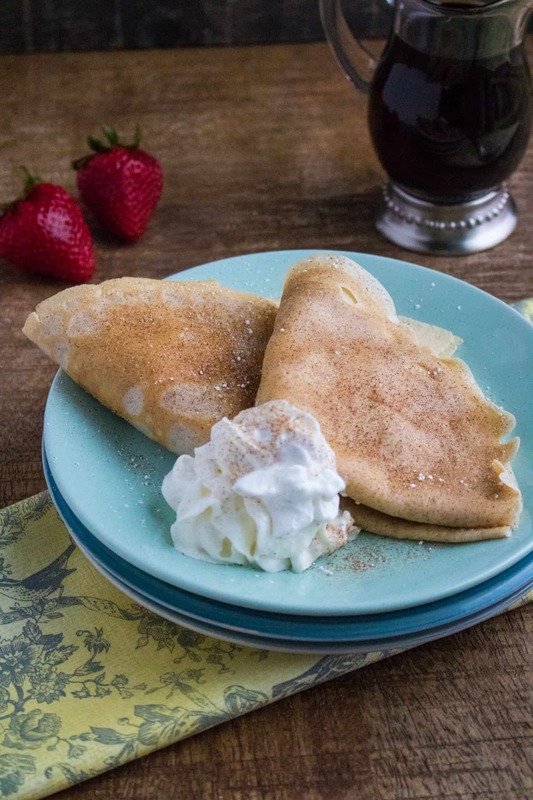 With this Snickerdoodle Crepes Recipe, it’s easy to make crepes that are deliciously sweet, soft, and slightly chewy, just like the famous cookie! Why is it Called a Snickerdoodle? The Joy of Cooking claims that snickerdoodles are probably German in origin, and that the name is a based on the German word schneckennudel, meaning “snail noodles”, because the appearance of the cookie is similar in color to that of a traditional sweet roll called schnecken. But, it is also possible that the name is simply a nonsense word with no particular meaning, other than serving as a fun and whimsical cookie name. Make sure your batter is smooth. 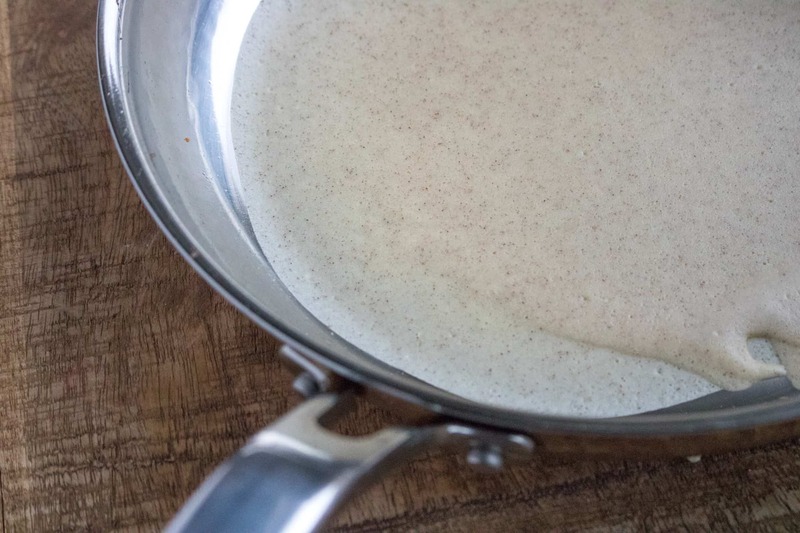 Thinner is better when it comes to crepes, and a silky smooth batter makes it easy to pour and spread out in the pan. We recommend using a blender to ensure the batter is fully mixed. 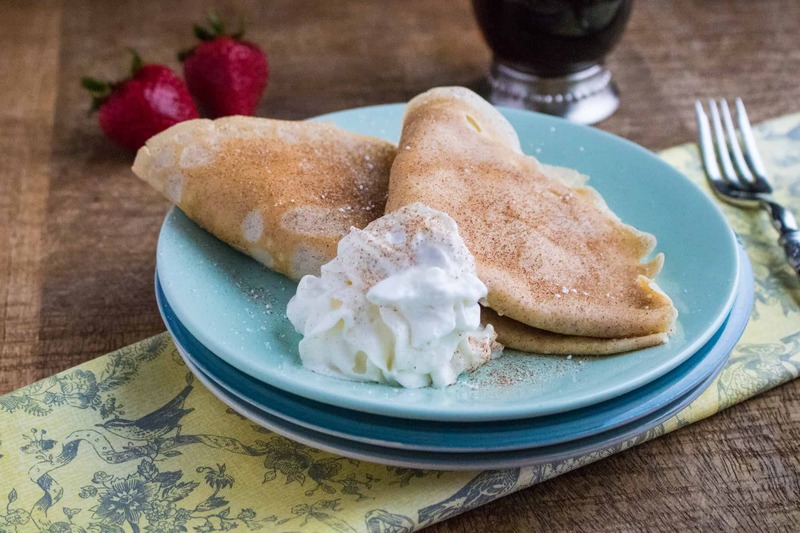 Using the right pan will ensure your crepes turn out just right, and while any good quality non-stick pan can work, purchasing a crepe pan can help you achieve a successful flip. Don’t flip it too early. Wait until the edges are starting to brown, and the surface no longer looks shiny before you try and flip your crepe. Flipping too early can result in sticking or tearing. Blend batter (first 8 ingredients) together in blender. Heat non-stick pan over medium low on stove. Spray with non-stick cooking spray. Pour batter into pan, about ¾ cup for an 8-inch pan. Pick up pan from the burner and tilt to spread the batter around the bottom of the pan. Moving it in a circular tilting fashion will spread the batter out evenly. Batter should go to the ends of the bottom part of the pan. When the top is noticeably cooked, flip the crepe to lightly brown the other side. Repeat process to cook the remaining crepes, setting finished crepes on plate with parchment paper between them to prevent sticking. For the filling, cream together cream cheese and powdered sugar. Add in granulated sugar and cinnamon, and stir to combine. Spread filling over the crepe, and either fold or roll up to serve. 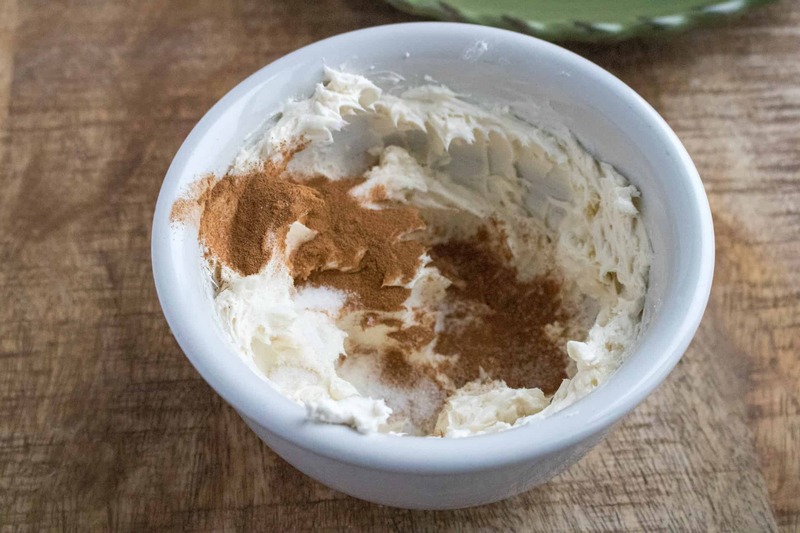 Finish with a sprinkle of cinnamon, sugar, and a dollop of whipped cream. Enjoy! Deliciously sweet, soft, and slightly chewy, just like the famous cookie! 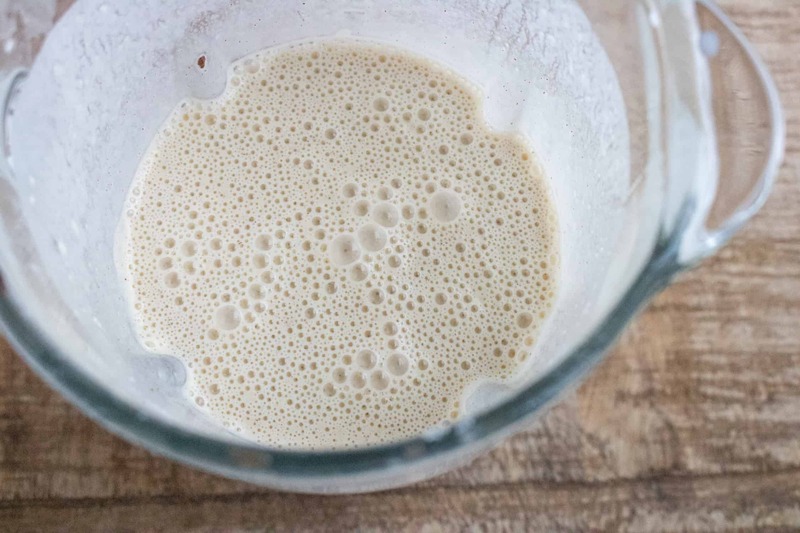 Blend batter (first 8 ingredients) together in blender. Heat non-stick pan over medium low on stove. Spray with non-stick cooking spray. Pour batter into pan, about ¾ cup for an 8-inch pan. Pick up pan from the burner and tilt to spread the batter around the bottom of the pan. Moving it in a circular tilting fashion will spread the batter out evenly. Batter should go to the ends of the bottom part of the pan. When the top is noticeably cooked, flip the crepe to lightly brown the other side. Repeat process to cook the remaining crepes, setting finished crepes on plate with parchment paper between them to prevent sticking. For filling, cream together cream cheese and powdered sugar. Add in granulated sugar and cinnamon and stir to combine. Spread filling over the crepe and either fold or roll up to serve.